Discussion in 'Cross Country, All Mountain & Trail Riding' started by ire, Apr 4, 2008. Here is the deal, I have last years XT group on my bike (trigger shifters w/hope brakes) and our team has a pro-order form with Shimano this year; would I notice a large performance improvement with the new XTR bits over the current XT? Below is a list of what I have and what I'm thinking about going to. My bike only weighs 21lb right now, so it would be cool to drop some more weight off of it. 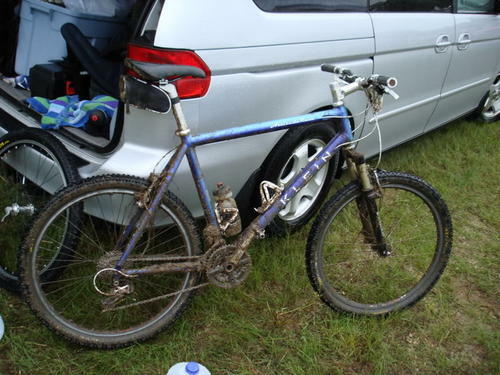 and I'm thinking about swapping it all out to XTR, including the wheels. i will say though the XTR wheels are total pimp! I'd go for it. The instant release as well as the ability for dumping 2 gears at a time is definitely worth it as far as the shifters go. My buddy who races for Cannondale said the feel of the new shifters from a mechanical standpoint feel much more positive and precise than any other Shimano shifter he's used(which is quite a long list). A buddy of mine had a set of Hopeyoustops and I'd say the improvement in power would justify the brakes, plus the lever feel is awesome. Then the cranks: I doubt there will be much in the way of a stiffness improvement. The cranks you have are supposedly stiffer than the M960 cranks(previous gen.), and I don't know if the new ones are any stiffer. I does, however, shift better with the carbon shift ramps, and the titanium teeth supposedly last twice as long as aluminum. I suppose you could keep your XT derailleurs, but the XTR shadow is the lightest RD on the market from what I was told. Plus it's the shadow setup, so it's tucked up and out of the way and has better cable routing. Maybe keep the FD. As far as my opinion on the wheels goes, those would be my first choice of any on the market (well aside from the DT XCR 1250 ). If I wasn't racing so much on the road and so little in the dirt, I'd be rolling on a set of those. The only new XTR item I purchased for my hardtail is the crankset. I felt it was a step up from XT and old XTR because of the chainring design as well as the weight. The items I think are a step down are the disc brakes. The old school XT work like charms, and while people using the new stuff insist it is better, I can get some level flex. Possibly the new levers have more leverage so you can get more flex, but my old school stuff feels great. Shifters and derailleurs I use the old stuff. Can't imagine there is much better. The wheels are awesome. The single best thing in the group. They are durable and light. The only downside is that the parts a expensive if you trash one. In the same stick incident that claimed the rear derailleur, ate 4 spokes. The spoke replacement was easy enough and has been the only time the wheels have needed to be messed with. Never had hopes so can't speak to the improvement BUT the XTR are great brakes. The modulation and power are perfect. They come with both the resin and metal pads. I stuck the metal pads in to brake in the rotors and they worked so good I never changed them. The only issue is that the pistons sometimes get gummed up and you have to lube them with mineral oil to get them moving in tandem. It's annoying but take a few minutes and I end up doing it about every couple of months. The shifting is much better with instant release. It shifts when you hit the lever not when you release it. Plus as mtnbikemike said you can dump multiple gears. I'm using the dual control which I love. My chainrings show very little wear just the normal nicks and scuffs and that's a year plus of hard use. Rear derailleur.... I trashed the new XTR with a gigantic stick (wouldn't have mattered shadow or not) and went back to my older XTR and didn't miss a beat. whatever that means. I didn't get the FD originally as it was the only part of the group on backorder. Eventually did get it and it actually is a little better than the older version. Not sure if its because the old one had become a rusted, dirt encrusted nightmare or what but the new one moves easier and quicker. The bearing preload for the new cranks is supposedly a great thing.... I have no clue what it does or how its better. The cranks spin easy and don't wiggle so whatever. If you have the cash get the whole group. The Shimano pro-deal is a nice bargain. If you can't afford the whole thing, start with the wheels, cranks, and whatever makes sense after that. But the wheels would be the definite starting point for me. The deal we are getting is below EP and if we buy enough product they said they would knock off another 15%. I think I'm going to do it, but this brings up another question for you guys.....STI or trigger shifters? I run STI on my road and cross bikes (obviously), but I've always used the triggers on mtb and have never even ridden the STI levers. I have little hands too, so I didn't know if reach would be a problem. I got the original version and took to them immediately (the new iteration is better). I've yet to inadvertently brake while shifting or shift while braking. Other folks got them and couldn't get used to them. Probably the same folks that wouldn't be able to learn a new phone number if they got one. You hit the lever up or down and it shifts.... not rocket science. If you can try a set somewhere before you buy them that would be a good thing. If you do get the dual control definitely get the rapid rise derailleur or whatever the official name is. Its crap with a regular derailleur. Oh and bleeding the brakes is a pain because you have to flip them upside down to get to the reservoir... that being said since I cut the hoses to length I haven't had to mess with them at all. XTR triggers and cranks = beautiful. I have almost the same opinion as DRB on the STI. I had the 960 dual control stuff with the rapid rise and loved it for racing(but had avid v's lthumbsdown: ). I never had a mis-shift, nor did it take me any time to 'learn' to use them...I haven't ever had problems shifting with different setups: Ultegra to Rival to LX trigger on the DH bike to XO, fwiw. Come to think of it, I have accidentally shifted my XO triggers more than my old XTR STI's.... 1,000,000 to 0. And if I had the choice I'd be on XTR, but my bike came with the spam and I can't afford the XTR bling. A lot of people who hate STI haven't put any time on it. Another thing to consider is a slight weight gain with STI, though I'm not sure how much. Just remember that price is for the brakes and shift levers. When you extend it all out the difference isn't that much. Make sure you are comparing apples to apples. When our team manager gets back on Monday I'll double check with him, he was just throwing back prices as I asked for em. I'll bet the STI levers end up cheaper when you kit it all out. Looking at the '08 EP form, the shifters+brake levers are $2.44 cheaper than STI. I have the full XTR group (FD, RD, Shifters, Crankset actually) on my Klein Attitude race bike. I have been a die hard SRAM X.0 user until the day I built the bike. For some reason the XTR crankset called my name (I can't imagine why) and I decided to try rapid rise. The new shifters were a no brainer and I went with the FD to finish it off. I could not be happier. The cranks are incredibly stiff and the new shifters feel amazing. Light, very fast shifts, and just a great feel. I barely had the money to build it this way (even working at a shop) but do not regret for a second that I did. You won't be disappointed. Good to know. Do you have other bikes with non-rapid rise? If so, do you find it difficult switching between them? My XC bike is actually my only bike with rapid rise ever. The first ride or two it was a bit strange, but after that I have never mis shifted because of it. I think it has something to do with them being completely different styles of bikes. If I had 2 DH bikes, one with and one without, it might get confusing. Now I just sit here typing this waiting for our local trails to dry out so I can actually ride something other than the urban bike or the road bike. Paul levers + Nokon Housing + Avid SD SL Calipers = one of the best performing rim brake combos I have ever felt. Whats the weight on that puppy? Not sure as I really don't have an accurate scale. It will be less in the near future because it's getting a new post (wasn't sure on the length when I first built it so it got a cheap one) and a new saddle (Selle Italia SLR Gel Flow). I may be swapping out the fork as well as it isn't breaking in as well as I had hoped. I am looking at the new Sid possibly. The steerer is uncut on the White Brothers so hopefully someone wants to give it a try. I'll try to weigh it at some point since I'm sure one of my cycling buddies has a scale. The new XTR crankset is ridiculously good. I may have been trying to justify the purchase but I swear it feels stiffer than the last gen XT it replaced. The bearing pre-load is a very good thing and although the new rings are awesome, when the time comes to replace them they are a standard pattern so you can use something less expensive. Plus, over time I had issues with the pinch bolts on the XT, which are gone on the new XTR. Good stuff. Otherwise, it's more about weight and wanting to go full pimp than actual performance.